Honestly I fell in love with Peanut Principle years ago. They have the BEST gourmet nut butters I have ever tasted. I purchased these for gifts for my family in hopes to spread the nut butter love this Christmas. I want them to love it so much that they never can go back to regular peanut butter. It is always delicious and I look forward to trying a few new flavors myself! Thank you for being a great company! This sample pack is awesome! I buy a lot of gourmet peanut butter, and in my opinion, this is the best there is. 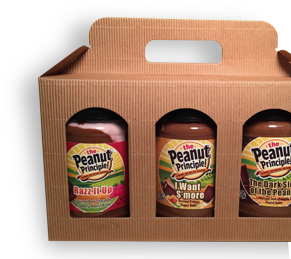 favorite gourmet peanut butter company! Love every single flavor, finished the pack in a few days they were too good! This gift pack was a hit! Delicious and top quality!